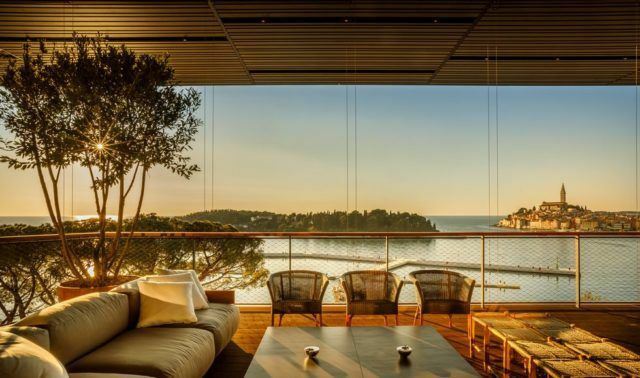 A view of Rovinj, quality architecture, spaciousness and premium service; are these enough to redefine what “luxury hotel” means? In the past, it might have been sufficient, but nowadays, the hotel must also be infused with a spirit that reflects the local environment, culture and lifestyle. A resort must become part of the city fabric and not just remain a foreign object within the urban environment. When design-savvy investors join forces with first-class designers, architects and marketing experts, the goal of redefining luxury becomes achievable. The CEO of Adris, Antej Vlahović, gave a telling statement at the grand opening of the hotel, declaring that mediocrity has never been an option for them and that only business excellence, local expertise and premium staff will do. Apparently, they have more than succeeded in this aspiration, for mere days after the grand opening, our impression was of having visited one of the finest hotels of the Adriatic. I don’t have a rational explanation for it – I just really love everything the team at 3LHD studio creates. I wonder if it is a generational thing. We belong to Generation X; it is said that this used to be the lost generation, condemned to wander the world, but it is now proving capable of producing such superb accomplishments as Hotel Lone and Grand Hotel Park. When I read the interviews with the creators I can feel the zeitgeist of the generation, and Park is definitely the culmination of that, both in terms of its architecture and in terms of the urban arrangement of the entire Monte Mulini area. The new plaza that was created in front of the hotel is poised to become a venue for socialising, games and gatherings. To me, the architecture feels organic, as if it has stood there forever. Every detail counts, no matter how small. Take the corridors, for instance; these are usually the boring part of a hotel, but here, they have been made interesting spaces in their own right. I find that such architecture facilitates self-reflection in myself, allowing me to step back from the routine of daily existence, as well as bringing me lots of aesthetic enjoyment. The Adris group invested well over half a billion euros into the renovation of the Monte Mulini area. They were the first in the Adriatic to combine the renovation of a particular destination with cutting-edge design, engaging in this effort the top experts in the field. The permanent team at Maistra includes the architectural studio 3LHD, the creative agency Bruketa & Žinić, the furniture designers Numen, the fashion designers I-Gle and others. This time, the permanent team of the Grand Park Hotel project joined forces with the renowned hotel interior designers from the Milanese studio Lissoni Architecture, who also share the investors’ basic philosophy of striving towards greatness. Nowadays, Croatia is home to a world-class architectural and design scene that aims to revive the splendid architectural tradition of the seventies. We hope that other investors in the region will follow the same path. I am especially glad to have yet another confirmation that premium design can also be functional. We can also understand the whole thing as evidence of social responsibility on the part of the investors. The million euro view is included in the price. The rooms have been integrated into the hotel fabric in such a way that the gorgeous Rovinj vista seems to be omnipresent. Further increasing the spacious feeling is the panoramic window and a pleasant terrace inviting you to spend the day outside. The floor is treated with a special coating that gives a welcoming and warm impression despite the industrial look, and also nicely complements the raw concrete wall that seems to organically connect every single piece of furniture. Partitioning the bathroom from the bedroom are semi-transparent glass panels that give a refined and minimalist appearance. Living up to their reputation, studio 3LHD have ensured the presence of numerous heart-warming details, as well as heavenly lighting. Every piece of furniture is a story in itself and part of a high-end aesthetic experience. The miniature graphics, the work of one of the resident artists, are part of the Rovinj Diaries story and they invite you to explore the town and its surroundings. The hotel room is a balm for both body and soul and will delight the hearts of curious explorers. The project itself is thoroughly described in what is, in my view, the best hotel guide I’ve ever seen. More than a mere guide, it is actually a sort of an omnibus of stories about Rovinj and about the artists who helped create the story of the hotel. Information about the hotel is included as if incidentally, in the form of short stories. The common thread is the history of Rovinj, with stories that entice you to explore. Bruketa & Žinić agency has managed to create a hotel guide you will want to read again and again; the kind you end up wanting to take home with you. The graphical concept wonderfully reflects the hotel architecture. If you want to fully understand the concept, the guide is mandatory reading; at the same time, it leaves the reader free to explore the hotel and the town of Rovinj, as well as Istria in general. I’m certain that it will go on to win numerous awards. The hotel will be well-visited in the colder months as well, thanks to Albaro Spa & Wellness. It stretches across 3800 m2 on two levels. The lower level features superb wellness facilities with minimalistically appointed saunas. Here, as well, the subtle lighting forms a part of the experience. One thing that is sure to draw many visitors to the hotel, however, is the infinity pool on the fifth floor. With its marvellous vista of Rovinj it can match even the heavyweights like the Marina Bay Sands in Singapore. The view of St Euphemia’s church from the pool is sure to become one of the most desirable locations for guests seeking that perfect Instagram shot. We can only hope that it will be possible to rent this extraordinary space for events—pool parties with a view like that are bound to be a hit. When you find yourself in front of the largest panoramic window in Europe, you will be left speechless. With a panoramic view of Rovinj in the background, meetings held here redefine the notion of a “conference hall with a view”. The central hall, which was still under construction at the time of our visit, holds around 250 people and can even admit vehicles. Complementing it are three smaller halls and a charming library suitable for small-scale meetings. All the halls are superbly appointed in full accordance with the latest trends in meeting design. The meetings offering had not been finalised at the time of the event and concrete information is yet to be made available. We do believe the meetings offering will include numerous public spaces and special venues that seem to be a perfect fit for organising events. Among other things, the management has stated that the setting will be perfect for automotive industry events with all the accompanying services. Naturally, the culinary offering will be at the five-star level; even this first visit made this clear. The staff are eager and very pleasant. We tried the main hotel restaurant Laurel & Berry. An attentive eye is likely to spot a few inconsistencies, but in time, these are sure to be taken care of. We can already confirm that, in accordance with the philosophy of the hotel and the Adris group, the wine selection, as well as the innovative menu and breakfast, are superb and solidly at the five-star level. There is no doubt that once the hotel takes off, the individual restaurants will be contending for a spot in prestigious culinary guides. Even now, just a few days after the opening, I can say that there were numerous details that left a considerable impression on me. There is no space to describe all of them, so let me point out just a few. In a few days, the promenade will come alive with a series of boutiques, restaurants and bars named Park Concept Store. The hotel rooms provide guests with a retro polaroid camera—a nice addition to the spacious and well-lit room full of details. In the marble bathroom with a luxurious bathtub you will find exclusive Molton Brown toiletries. The hotel is not aimed solely at the wealthy; it is the ideal “getaway” for people who appreciate the genuine experience of Istria and its hospitality in a luxury hotel. The hotel officially opens with the Adris 44 Cup regatta that will be held from the 28th of May to the 2nd of June in 2019. During this time, Rovinj will host the global sailing elite. The RC44 class is considered to be the Formula 1 of sailing, featuring the best sailors of the world, including Olympic medallists and winners of the America’s Cup and numerous other regattas. Just as we left Rovinj, Grand Park Hotel opened its door to the film crew of The Hitman’s Wife’s Bodyguard, a sequel to the 2017 movie, The Hitman’s’ Bodyguard. The movie is starring huge Holywood stars, including Samuel L. Jackson, Salma Hayek and Ryan Reynolds, who started filming near the Old Town of Rovinj and are staying in the Grand Park Hotel. The BEHIND THE SCENES section is not paid. The selection of the hotels that are evaluated by our journalist is at the discretion of the editorial board and the visits are unannounced.